Certain situations require a Mac to be booted from an external boot volume, rather than the primary startup disk. There are plenty of reasons for booting from external volumes, whether it’s to troubleshoot problems, repair disks, partition, format everything, update, or even reinstall Mac OS X. We’ll cover the two easiest ways to do this, during boot with the Mac Boot Manager, and also through System Preferences using the Startup Disk selection tool. You’ll need a bootable drive of some sort to be able to do this, whether it’s a USB installer drive you made yourself for macOS Mojave, macOS High Sierra, macOS Sierra, Mac OS X El Capitan, Yosemite, for OS X Mavericks or prior versions of Mac OS X, a mirrored external hard drive made through SuperDuper, or even a boot disc. Any Mac running Lion (10.7) or newer will also be able to use the Boot Manager to startup from the Recovery partition. You will find that external drives typically are shown with an orange icon, with their interface printed on the icon itself. Similarly, CD’s and DVD’s are shown with a disc icon. 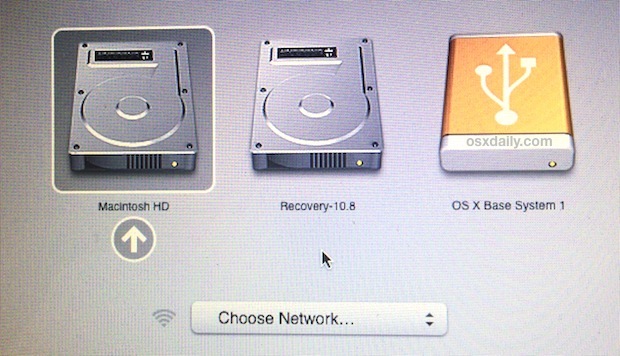 In this screen shot example, the right-most orange boot drive is a USB flash disk. This option on boot trick works for quite literally any boot volume, whether it’s an external USB drive of any sort, a Thunderbolt hard drive, boot DVD, CD, the Recovery partition, even in dual-boot environments with other versions of OS X, or a Linux or a Windows partition with Boot Camp, if it’s bootable and connected to the Mac it will be visible at this boot manager. Though boot DVD’s and CD’s will be visible through the aforementioned boot manager, you can also start the Mac directly to DVD or a connected disc by holding down the “D” key during restart after you hear the chime. This is fairly uncommon these days, but it was the primary method of accessing recovery partitions before Mac OS X became a download from the App Store, and before USB installer drives became more common. Additionally, Macs with recovery partitions can be start directly into Recovery HD by holding down Command+R during system start. Though recovery and discs can be booted with their own commands, it’s ultimately easier to just remember the Option key method since it is a single key and because it’s universal. The only exception is with target disk mode, which requires a different sequence to use. You’ll also notice an option to join a wi-fi network when at the Boot Manager, that can be left alone unless you need to perform an internet restore of Mac OS X. One thing to consider about this approach is that the setting choice stays in place until it has been changed again through the Startup Disk Manager. This means that if the chosen startup volume has been disconnected from the Mac, on the next reboot a blinking question mark may appear, because the set startup disk is no longer visible. If that blinking question mark is persistent, that can be easily remedied by holding down the OPTION key, selecting the normal Macintosh HD boot volume at startup as outlined above, and then going back to Startup Disk in System Preferences to choose the proper MacOS or Mac OS X startup volume again. Can you recommend an external hard drive that will be able to reboot the OSX. I am considering getting Carbon Copy and they insisted that I get an external drive that is rebootable. I am trying to find one that actually says it on the tin, which is proving quite difficult. Any advice would be greatly appreciated. As long as the drive is connected to the computer, the backup using Carbon Copy should work. If you find an external hard drive and have any questions about it, try asking their support. By work I meant boot up on the computer. Out of my MacBook plugged it into another macbook to just test the computer itself. It booted fine in the other computer. Then i put it back into my regular MacBook and it won’t boot. Either partition. It won’t allow repair of permissions. I’m stuck. I did do a new image of each partition to an external drive. What do you recommend? I do not want to loose all the info on the drive. I have a late 2011 logic board cooker that’s about to be replaced with a newer model (at my expense). I was not looking forward to replacing some high priced music production software that’s not compatible with whatever the current iteration of OSX happens to be. I will be very happy (and less broke) if I can just yank out the drive from my old mbp, put it in a case, plug it in via USB, boot from it, and run my older software. I installed a new 500gb hard drive today and reinstalling mac OS X from an external drive. The first time I got a circle with a diagonal line through it on the screen, after I saw the apple, and the spinner was spinning below the circle. A friend told me to try restarting with the option function, which now brings up the error message “You need to restart your computer…” every single time. I tried suggestions above including “D”, Apple-R, “option”, and “C”. What is the solution to get past this? Take your HD out and install it into a inclosure box. Then connect it to your usb connector on your made and restart computer. If your computer starts and boots. Then its your HD wire. Need to replace it. I just tried this but it doesn’t work is there another way? I was getting a folder with a question mark so replaced my hd with a ssd hd. I’ve tried several times to boot off my external drive I select it and then keep getting the folder worn Question mark. Any suggestions? 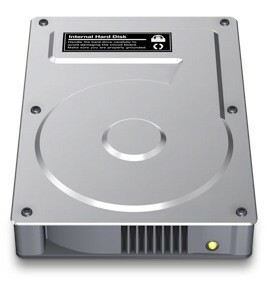 Can I put the hard drive from my old macbook pro on a USB ENCLOSURE and then boot the OS X on a new Mac? Can i use an external hard drive to boot up my Macbook daily? Does switching between the internal macintohs and the external hard drive back and forth faily damage my Macbook in any ways be it software or hardware? i get stuck it’s been nearly 24hours and it’s been setting up your mac when trying to install and boot from my external hard drive for the first time, any help? I have a mid 2011 iMac 27″ that I have converted to booting from an external SSD using a thunderbolt cable and a RocketStar drive bay. When it works, it works great! But the problem I am fighting is when I start the Mac, the external drive does not light up and is not recognized causing my Mac to boot into recovery mode. If I unplug/plug the external drive a few times, it is eventually powered and recognized and then it boots. Does anyone have any ideas how I can convince the Mac to see the drive, recognize it, and boot from it without my having to disconnect & reconnect the thunderbolt cable multiple times?